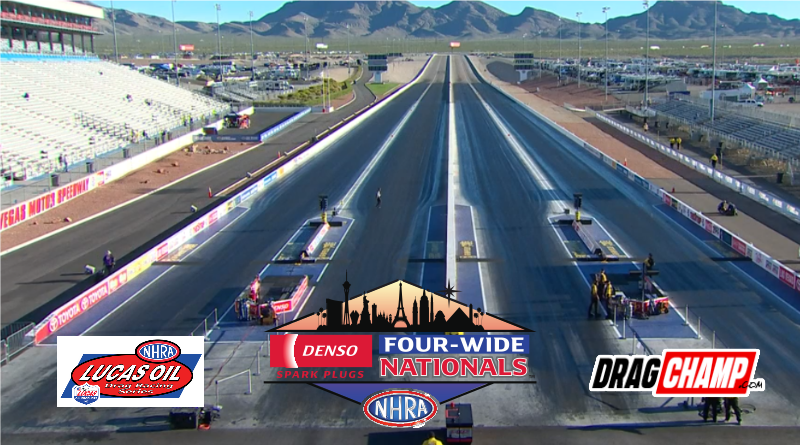 Las Vegas – Day 2 is in the books at the NHRA Four-Wide Nationals at the Strip at Las Vegas Motor Speedway. After a day of qualifying and time trials, sportsman racers moved into final eliminations Saturday morning. Stock Eliminator competitors worked through three rounds of eliminations while Super Stock, Super Comp, and Super Gas ran two rounds. Top Sportsman, Top Dragster, and Competition Eliminator only made one round of eliminations on Saturday. Racers that made it to the Big Show on Sunday will have a full day of competition as they face several rounds of eliminations. Below is a recap of each class. DragChamp pick to win Ralph Van Paepeghem qualified in the ten spot but fell in the opening round. Paepeghem drew 2018 event winner Joe Mozeris in round one. Mozeris missed the tree but outran Paepeghem but a tenth to move into round two. Other winners included Tom Mettler, Alan Freese, Randy Jones, Josh Lee, and Doug Lambeck. The talent laden Super Stock field produced a number of great matchups in the first two rounds. Dan Fletcher turned back Brad Burton by .002-second in the opening round. Kyle Seipel used a killer .004 light combined with a .021 over 8.601 to take down Jody Lang. And finally, Jimmy DeFrank took down Jackie Alley by .010 in a double breakout race after both drivers posted .01 lights. After posting a six-pack (.000 light and dead-on six ET) in the first round, two-time 2019 national event finalist Rick McKinney fell to Wayne Taylor in round two. In other round two races Bo Butner took out Mike Cotten with a .011 light, Justin Lamb went -.003 red, and Dan Fletcher left -.002 early against Anthony Bertozzi. Bertozzi is the last man standing from the Team DragChamp picks to win after Jackie Alley and Dan Fletcher went out. Two of our DragChamp picks to win fell in round one. Luke Bogacki turned it red by -.002 and Brad Burton took too much stripe to break out by -.006. That left Jody Lang to carry the torch. Lang did just that by taking out Gatornationals winner Randi Lyn Shipp. In a titanic battle Jimmy DeFrank used a .006 light and a .016 over 10.006 to defeat Dan Fletcher. Fletch posted a .037 light in the loss. The key matchup of round two included Ryan Mangus versus Jody Lang. Lang nailed the tree with a .003 light while Mangus followed with a .023. Lang took too much stripe to break out -.012 while Mangus posted a safe .021 over 11.061. After three rounds of eliminations, just nine drivers remain. Those drivers include Jeff Jerome, Larry McLanahan, Greg Luneack, Justin Jerome, Ryan Mangus, John Shaul, Billy Maddox, Ryan McClanahan, and Andy Kimball. Fifteen drivers remain after two rounds of competition in Super Comp. The remaining group includes a who’s who of Super Class stars. Tomorrow’s winner will have their hands full with names like Kinard, Labbous, Bogacki, Brannon, and more. Also in competition is two-time 2019 national event finalist Kevin Wright, Marko Perivolaris, and Ryan Herem. Team DragChamp was two for three in round with after Aaron Kinard and John Labbous Jr. are still alive. Chad Webber fell in round one. Team DragChamp picks fell early in Super Gas as Marko Perivolaris and Craig Maddox lost in the first round. Phil Unruh followed suit after dropping a double breakout race with John Labbous Jr. in round two. Like all of the sportsman classes, a star -studded field remains for Sunday eliminations. Two-time 2018 national event winner Matt Blodgett moved into round three after winning a virtual dead heat against Bradley Johnson in round two. Winternationals winner Pete Zak, Super Comp world champ Steve Williams, and Ken Mostwich will also compete for the trophy on Sunday. Two-time national event winner Bart Smith is looking for number three after a redlight victory over Michael Chitty in round one. Justin Lamb drove Phil Unruh’s Corvette into the second round after a double-breakout win over Monte Green. Team DragChamp picks to win Dan Lafferty and Don Meziere both moved into round two after round one victories on Saturday. Other notable racers moving into round two include Doug Crumlich, Joe Roubicek, Bud Preuss, and Jeff Gillette. 2018 event winner Mike MacBrair kept his dreams of going back-to-back after a redlight victory over Dean Hall in round one. MacBrair was locked and loaded posting a .004 light and a .012 over 6.592 in the win. Winternationals winner John Taylor Jr. and Arizona Nationals winner James Warden both moved into Sunday after posting wins in the first round. Gatornationals winner Anthony Bertozzi will join them in round two. Team DragChamp pick to win Thomas Bayer won first round while Zach Sackman turned it red by -.005 in round one. DragChamp will have final sportsman race results on Sunday. Check with DragChamp daily for NHRA sportsman racing news and results.